The Gulfridge subdivision offers a rare selection of new condos for sale in Manasota Key off North Beach Road. Their sites can draw buying interest being just a short distance from the Tom Adams Draw Bridge, the south span linking the island with Englewood. These new condo units are in two separate and distinct developments which were completed between 2015 and 2017. One is a row of two-story dwellings backing up to Lemon Bay. 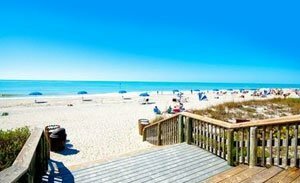 The other is about half a kilometer north and which has been branded as the Waves of Manasota Key featuring a small, but high-end three-story building on the Gulf of Mexico side of North Beach Road. 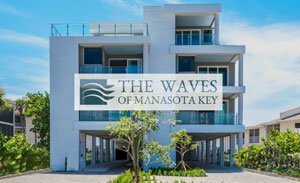 The Waves consists of just five luxury units with living areas ranging from 2,905 to 3,075 square feet, designed with three bedrooms and three baths plus a half-bath. These condos are priced from $1.4 to $1.65 million, flaunting features which could match most of the upscale condos for sale in Sarasota. Each condo unit at The Waves on 2690 North Beach Road boasts of its own private infinity-edge pool and spa overlooking all the grandeur of the Gulf of Mexico. The building’s contemporary, terraced design provides all the residences with a covered patio leading to the pool area in order to create privacy to the residents. The interior finish of these condos are as impressive in such exquisite renderings as recessed lighting, tall ceilings, chef kitchens, and ceramic plank flooring. Access to each unit is through a secured elevator entry, and a fully enclosed garage plus storage is bundled with a condo in The Waves. The appointments of the newly built Gulfridge condos for sale off Lemon Bay, though definitely much simpler, could nonetheless be appealing, especially to investors on rental properties. These units feature living areas of between 780 and 950 square feet designed with two bedrooms and one to two baths. Offered fully furnished, these new Gulfridge residences provide partial ocean views and two decks. All also come with granite counters and tile floors in their beautiful kitchens. Pricing of these units is in the $200s, an ideal level for aspiring investors to do some pencil-pushing and factor in the condos’ rental policy of 1‒7 days minimum lease length. 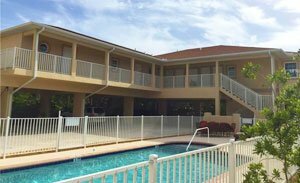 Although poles apart in their market positioning, the charm of these newly constructed condos of Gulfridge converge in the pristine Manasota Key Beach as well as the Old Florida ambience that Englewood has managed to retain. Significantly, the planning officials of both Sarasota and Charlotte counties, which have jurisdiction over respective Englewood localities, share a common stand on preserving these areas’ small-town feel and natural beauty. For this reason, high-rise condo towers common to many other Gulf Coast beaches are absent in Manasota Key and in mainland Englewood as well. But just the same, residents of local communities enjoy the life and leisure delights available in other parts of the region. In Englewood, there already are plenty of choices on shops and restaurants; there’s even a local farmers’ market. Moreover, vital road corridors are nearby as convenient links to other lifestyle centers, such as those in Venice and Sarasota which has also helped shape demand for the new condos at Gulfridge. Below are the current real estate listings available at Gulfridge.